Chinese stimulus may rescue more than just the domestic economy. Deutsche Bank AG predicts that the so-called National Team — a collection of state-backed institutional investors set up by the Chinese government to stabilize the market in mid-2015 — will be back with a vengeance after the Shanghai Composite Index posted its lowest close since 2014 on Monday as trade tensions ratcheted higher. 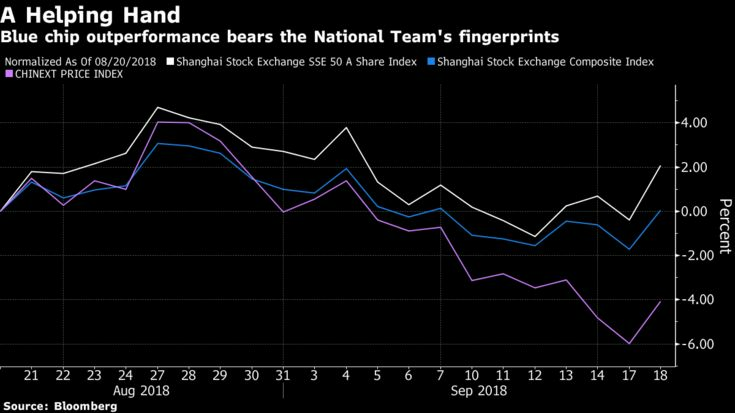 “The team usually steps in to act as a market stabilizer when the stock market experiences a rapid and sharp correction, or during politically-sensitive periods,” analysts Michael Tong and Luka Zhu wrote in a report Tuesday. In fact, that group of 21 entities with more than 1 trillion yuan ($145 billion) in assets under management may already be propping up the market, they write. “By making insurance companies the direct source of funding, the government looks to be encouraging more long-term capital to participate as a ‘market stabilizer,’” they added. The analysts also highlighted strong inflows into exchange-traded funds that track major indexes and a refinancing arrangement by one investment firm to boost cash reserves as indicative of current and future support for stocks from this cohort. Ken Chen, a Shanghai-based analyst at KGI Securities, also suggested the afternoon recovery in the Shanghai Composite on Tuesday was attributable to this state-backed stock stimulus. The equity benchmark rose 1.4 percent as of 1:41 p.m. on Wednesday. The return of the National Team is likely to benefit the Agricultural Bank of China Ltd., China Yangtze Power Co., China Pacific Insurance Group Co., China Vanke Co., TILI, FOCUS MEDIA, Wanhua Chemical Group Co., Huayu Automotive Systems Co., Angang Steel Co. and Zhengzhou Yutong Bus Co., according to Deutsche Bank. These stocks are all rated buy by the bank’s analysts, have dividend yields above 3 percent, and aren’t already well-owned by these investors. If the Shanghai market stabilizes and recovers from National Team support, that should bolster overall sentiment and lift shares that trade in Hong Kong as well, Tong and Zhu concluded.